This high-quality product is made by a leading manufacturer to replace the humidifier filter (AKA water panel, water pad, evaporator pad) in many makes and models of whole house humidifiers. This product is found in the large bypass and fan-powered humidifiers manufactured by Bryant, Carrier, Totaline, Day & Night, Payne and many others. This humidifier filter includes an integral aluminum frame and felt wick on top for even distribution of water through the media. 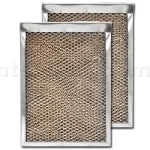 The filter is constructed using an expanded aluminum mesh pad covered with a special clay-like coating that absorbs water and removes mineral deposits. The process of humidification begins when water flows through a humidifier valve and soaks the filter. Hot, dry air from the furnace or fan coil passes through the filter and absorbs the water. The moist air is then distributed through the home via the forced-air duct system. It is recommended you replace your whole house humidifier filter at least once per heating season. Areas with hard water may require two changes per season to ensure peak performance. Dimensions are approximately 10-1/2" X 14-1/2" X 1-1/2".